Here is a grizzly bear getting ready to catch some food. Today I want to write about one of my favourite animals, the grizzly bear. These massive animals are the American sub-species of the brown bear and can grow up to 3 metres tall when they stand on their hind legs. Males are much bigger than females and grizzly bears that live near the coast are much bigger than inland bears. They range in colour from very light brown to almost black and their claws grow about 4 inches long which helps them dig and catch fish. Their jaws are powerful enough to crush a bowling ball and they also have a very big muscular hump on their shoulders which gives them the strength to run very fast. Grizzly bears have a very diverse diet, including berries, pine nuts, grass, salmon, trout, small mammals, moose, elk, caribou, bison, bighorn sheep and deer. They hibernate for half the year during the colder months, sleeping in large dens where they don’t poo or wee for the entire period. The females give birth while they hibernate, with the babies suckling on their mothers while she sleeps. To prepare for hibernation, grizzly bears put on a lot of weight and eat anything that they can. 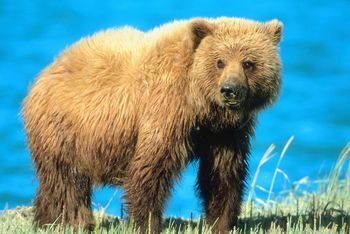 Grizzly bears are mostly found throughout Alaska and Canada, with smaller populations in Wyoming, Montana, Idaho and Washington. They used to live as far south as Mexico, but they are now extinct there. Are there any other interesting facts that you would like to share about grizzly bears?